As NBA enthusiasts across the globe get ready for the exciting action and intense competition of the Playoffs, Charlotte Bobcats fans should take pause to reflect on the end of an era – The DeSagana Diop Era. It’s not often that a team says goodbye to one of its Big Three (salary bandits). So, this is a great opportunity to survey the impact that the giant’s departure will have for the club. Oh, how time and paychecks fly by. It seems like it was just yesterday that the Bobcats were pressured by Larry Brown and duped by the Dallas Mavericks into swallowing Diop’s ridiculous contract in exchange for Matt Carroll and Ryan Hollins. Since then, ‘Gana has eaten up over 11% of the team’s salary cap with few contributions to justify it. Acquiring the Senegalese seven-footer immediately hamstrung the ‘Cats efforts to retain their much better Center, Tyson Chandler in the 2010 off-season. 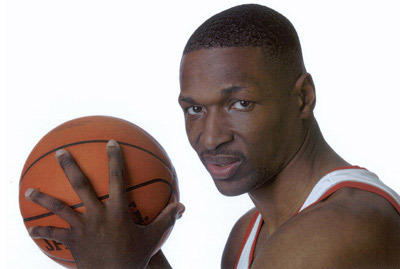 Regrettably, Charlotte had to take back Matt Carroll, Eduardo Najera, and Erick Dampier’s contract in a financially-driven trade, delivering Chandler to the Mavs where he went on to win the championship. Oh, and then Tyson picked up the NBA Defensive Player of the Year Award in 2012. But, those wiry ol’ Bobcats still had Diop on their bench! Another fun fact – Ryan Hollins is a contributor off the bench for the Playoff-bound LA Clippers and played over three-times as many minutes as ‘Gana did this season. It’s highly likely that Diop will step away from the NBA, and walk off into the sunset (after he collects the last of his $7,372,200.00 from the Bobcats this month). Despite the pain that he’s caused Michael Jordan’s wallet, it looks like the guy has actually done some pretty good things off the court with the NBA Cares program. Just as ‘Gana Diop had started to show what he could do on the court, his season was put to an end. 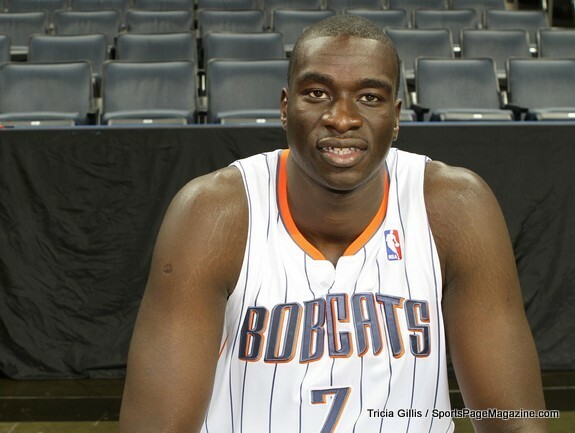 The injury that sent Diop to the floor during the Bobcats’ last game appears to be a torn achilles tendon. More information is available at ESPN.com. This is a pretty serious injury for anyone, especially a professional athlete. 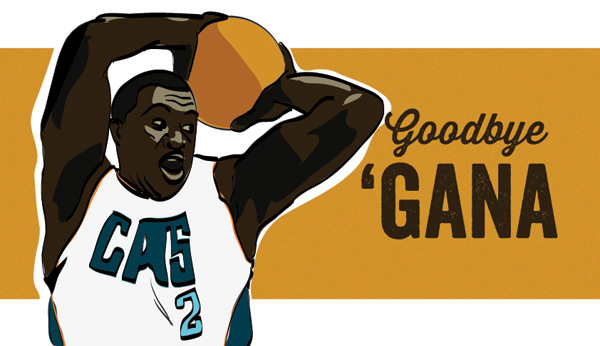 Let’s hope this is just the end of ‘Gana’s season, not his career. 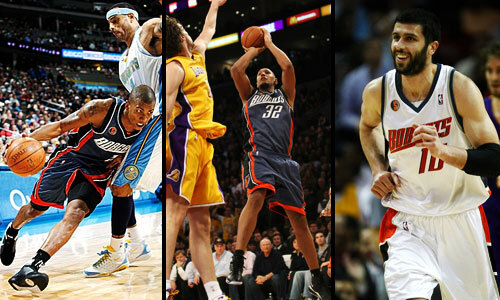 Now, the Bobcats face the rest of the season with Nazr Mohammed, Kwame Brown, Tyrus Thomas, and Boris Diaw filling the Center position. The temptation to trade Boris gets a little trickier now that the team has lost a big man in Diop. What should the Cats do, now? The Charlotte Bobcats notched their second straight impressive road win by defeating the Cleveland Cavaliers 91-88 on Sunday night. AP recap here, box score here. The Cats had been 1-13 on the road prior to this weekend, and a back-to-back in Miami, then Cleveland didn’t exactly hold much promise for getting well. However, the Cats have apparently turned over a new leaf. This one was tied with under a minute left until Flip Murray drained a three off the dribble. On the next possession, Flip fouled Shaq, who only hit one of two free throws. Raymond Felton nailed a 20-footer in Anderson Varejao’s grill to go up by four on the Bobcats’ ensuing possession. From there, the Cats took care of the ball and hit their free throws to secure the win. Lebron did have a look at a potentially game-tying three at the buzzer from the corner, but it bounced off the rim to end the game. Larry Brown played a tight 8-man rotation in this one, with only DJ, Gana and Flip getting off the pine. Nearly everyone was effective: Jack led the scoring with 22 points (perfect 4-4 from the line; he’s now made 35 FTs in a row), Crash had another double-double with 19/12, and Felton had another strong game with 17 points on 8-13 FG and 6 assists/0 turnovers. Gana Diop deserves special mention, as he played 27 minutes, scored 8 points on 4-5 FG, grabbed 6 rebounds, blocked 2 shots, and (seriously) really seemed to spark the Bobcats with a +11 +/-. The Bobcats are taking much better care of the ball in the New Year; only 11 turnovers tonight, again well below their season average. They also continued their sharp shooting from the free throw line: 16-19 tonight. The Cavs were led by Lebron (29 points) and Mo Williams (27 points). Boris Diaw played 38 minutes and did have 6 assists/0 turnovers, but didn’t score or tally a defensive rebound. Is it just a coincidence that the Cats have gotten themselves into a groove with Tyson Chandler out? If it’s not just a coincidence, it is rather concerning. Several streaks came to an end tonight: the Cavs came in on a 7-game overall win streak and an 11-game home win streak. Also, the Bobcats had lost 10 in a row in Cleveland. The Bobcats are headed back home: next game is at the Cable Box on Tuesday night against the Chicago Bulls (7 PM ET).